The Vindicator maintains our El Tormentor's advantages in small waves while a few design adjustments give it more performance and control in bigger surf. 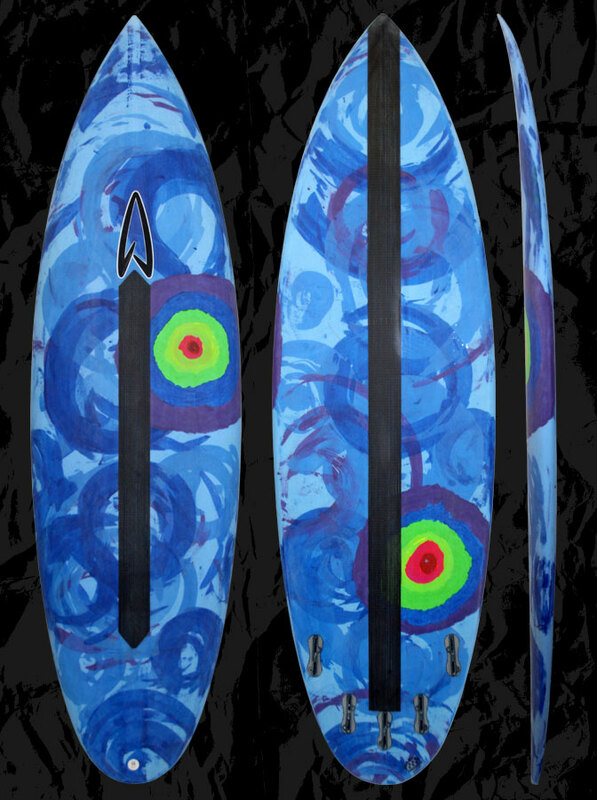 Super high performance thinned out shortboards are made to work best in perfect waves. The Vindicator is more for everyday surfing and even some better days you might luck into. For great paddling and gliding though flat spots, especially when it's small, it has a good amount of foam under your chest and low entry rocker. We knew low tail rocker like on the Tormentor works in a broad range of surf but its advantages are felt mostly on smaller or flatter faced waves. Wanting to give The Vindicator more upper range, we designed it with a more moderate tail rocker that still works terrific in small surf. Where it shines though is allowing you to control speed plus have the ability to pivot easier in the pocket on those days you're surprised the waves are better than your normal waist high go outs. Giving The Vindicator a rounded tail lengthens rail line and reduces tail area which is awesome for doing arcing turns on bigger faces while still having release off the top for vertical maneuvers in small to bigger surf. We also thinned its tail letting it be pushed around with less effort and giving it more sensitivity at higher speeds. Bringing it all together, The Vindicator is a really versatile as well as responsive high performance board. Or sized bigger, it can be a fantastic all around board for someone looking to get into shortboards or wanting more paddle. The tail rocker is not extreme, being moderate it's slightly more than the Tormentor's low tail rocker for easier pivot in the pocket or at higher speeds in bigger waves. It has low entry rocker for paddling and is slightly flipped in the last 8 inches of the nose to allow vertical maneuvers in the pocket. Waist to Overhead+, soft to punchy point, reef, or beachbreak. Ride The Vindicator in the same dims as your Tormentor. Or same thickness but 1" longer & 3/8" narrower than a WD, WD2 or similar. Comparing to a pro model shortboard go 1-4" shorter, 5/8" wider and same thickness. For a high performance approach and based on your height, aim for about the same length to as much as 3” shorter as you are tall, matching volume to skill level, needs, or preferences. Up in volume and at your height or beyond for additional stability and wave catching ease. Please feel free to use our CONTACT US form for more info about our boards and sizing.